Holi, the festival of colours, falls on the full moon day in the month of Phalgun - March of every year. Holi heralds the arrival of spring - the season of hope and new beginnings. It is a glorious spectacle, a riot of colours - crimson, red, pink, orange, purple, yellow and green. On this day people throw coloured powder gulal or coloured water on each other. 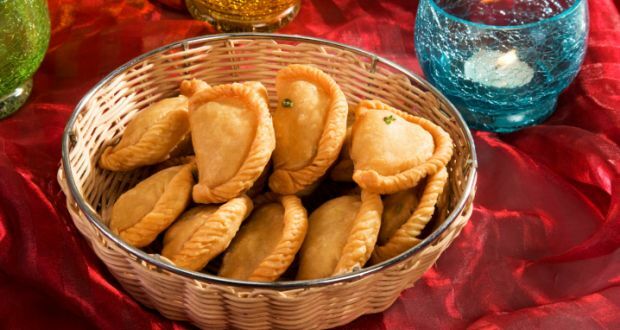 Native to Rajasthan, gujiyas are sweet dumplings made of maida or flour and filled with a delightful khoya and dry fruits mixture. Deep fried in ghee and dipped in a sugary syrup, this Indian dessert is commonly made during the festival of Holi around the country. Rub 1/4 cup ghee into the flour and knead into a stiff dough with water. Leave to rest for at least half an hour. Saute the khoya over medium heat till it looks slightly fried. Take off the heat and when it cools, mix in the sugar, cardamom and almonds. Shape the filling into ovals about 21 cm length and 1 cm thickness. Make balls of the dough and roll out into 1 cm / 1/8 in thick rounds. Take a round, wet the edges with water and place a piece of filling over one half. Fold the other half over and press the edges together to seal. Either cut off the edge with a fancy cutter or make a design by pinching and twisting all along the sealed edges. Make all the gujiyas in this way. Heat ghee in a kadahi. To check if the ghee is hot enough put a piece of dough in it. If it comes up at once, add as many gujiyas as fit in comfortably. Turn them over and lower the heat to medium. Fry till golden brown on all sides. Lift out and leave to drain on absorbent paper. Dip the gujiyas in it, lift and let dry on a plate. Fry the rest, increasing the heat for a few seconds before adding the next lot. Can be eaten hot or at room temperature and can be stored in air-tight containers.